In a village at the edge of the wilderness of northern Russia, where the winds blow cold and the snow falls many months of the year, a stranger with piercing blue eyes presents a new father with a gift - a precious jewel on a delicate chain, intended for his young daughter. Uncertain of its meaning, the father hides the gift away and his daughter, Vasya, grows up a wild, wilful girl, to the chagrin of her family. But when mysterious forces threaten the happiness of their village, Vasya discovers that, armed only with the necklace, she may be the only one who can keep the darkness at bay. I thought this was such an unusual idea for a book that I just had to read it for myself. I don't believe that anyone is ever too old for fairytales, in fact I think that many myths and legends are kept alive by being told to children as fairy stories. 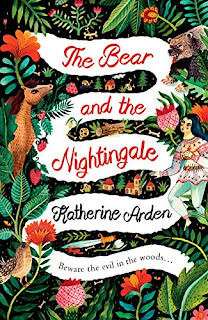 The Bear and the Nightingale doesn't read like a traditional fairytale, it is definitely a novel for adults but contains a sprinkling of magic and the eternal battle of good against evil. It was sometimes hard to get used to the Russian names, especially when the characters are also referred to by their affectionate family names. For example, the main character, Vasilisa is referred to as Vasya by her family. Once you got the hang of it though, it does become clear who everyone is. Pyotr and Marina are expecting another child and Marina knows there's something special about this one. Unfortunately, Marina dies giving birth to Vasilisa (Vasya) but it's like the time that Obi Wan Kenobe felt a disturbance in the force, as the hidden world feels Vasya's presence and the destiny that awaits her. I had never heard of protective house spirits called domovoi or rusalka, which are water nymphs. I'd like to think we all have a domovoi residing in our homes, looking after our wellbeing, and it reminds me of the tradition of leaving a glass of milk and cookies for Santa on Christmas Eve. Perhaps we should leave a little glass of something each night for our very own domovoi. The Bear and the Nightingale is a difficult book to review without giving away any spoilers but I found myself so completely immersed in the book that I could almost feel snowflakes landing on my nose. There is a jaw dropping battle at the end, not quite between good and evil, and a few of the characters are quite prepared to pay the ultimate sacrifice to save their loved ones. 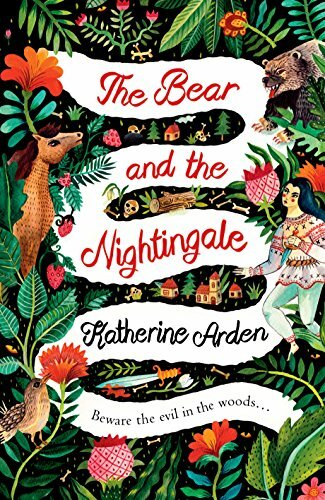 It's goosebumpy reading and not just from the chilly temperatures; The Bear and the Nightingale is an outstanding fantastical fairytale for adults. I chose to read an ARC of The Bear and the Nightingale and this is my honest opinion.